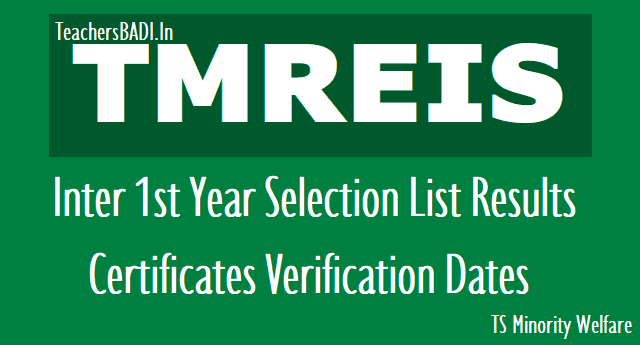 TMR Junior Colleges Inter 1st year Admissions 2019 (TMREIS TS Minority Welfare) Selection List results, Certificates verification Dates 2019: TMREIS notification has been issued for TMR Junior Colleges Admissions into Intermediate 1st Year for the Academic Year 2019-2020. Online Enrollment has been completed for Intermediate first year admissions in TMR Junior Colleges 2019. Online Registration for TMR Junior Colleges was completed from 25-02-2019 to 15-03-2019 for Telangana Minority Welfare Residential Schools Admissions into Intermediate 1st Year for the Academic Year 2019-2020. Online Applications are invited through TMREIS Official website tmreis.telangana.gov.in from the eligible candidates from Minorities (Muslims, Christians, Parsis, Jains, Sikhs & Buddhists) and Non- Minorities (SCs, STs, BCs & OCs) Communities for Fresh Admissions into IntermediateFirst Year in TMR Colleges of Telangana State. After the selection process, the list of provisionally selected candidates will be displayed in the respective Junior Colleges and communicated to the candidates over phone through the mobile number furnished by the candidate in the online application. The provisionally selected candidates should report to the respective Junior colleges with the following documents in original along with one set of Xerox copies of certificate for verification. b) The candidates who have passed X class Board Exam other than SSC Board of Telangana they should submit the equivalence certificate issued by the competent authority (SSC Board, Govt. of Telangana). c) Bonafide Certificate duly mentioning the Date of Birth issued by the concerned school where the candidate has studied class X.
d) Transfer certificate issued by the School where the candidate has studied Class X.
j) For Orphans – Certificate issued by the Tahsildar. i. For the persons of Scheduled castes converted to Christians & their progeny (BC-C) the community certificate issued by the Tahsildar. ii. For all other persons converted in Christian either of the following proof shall be submitted. - The Transfer certificate/leaving certificate/Bonafide issued by respective schools wherein it is mentioned as Indian Christian/Roman Catholic/Anglo Indian. - The Baptism certificate issued by Church authorities to the student/Individual or if in case student does not have Baptism certificate then their Father/Mother/Guardian’s Baptism certificate. l) Two Passport size Photographs of candidates and one Photograph of Parents. The provisionally selected candidates should also attend the medical screening test arranged by the Junior college wherein the candidate was selected for admission and the candidates who are medically fit only will be eligible for admission. Admission of Provisionally selected candidates is confirmed subject to submission of above certificates and medically fit.